This is the brief considered by the EAT- Lancet Commission that has brought together 37 world leading scientists to reach a consensus that defines a healthy and sustainable diet. Their report is important to read as the food we eat and the ways we produce it, the amount wasted or lost has a major impact on human health and environmental sustainability on Earth. The report recommends reducing our meat and sugar by 50% and doubling our intake of vegetables, legumes and nuts. Getting it right with food will be an important way for countries to achieve the targets of the UN Sustainable Development Goals and Paris agreement on climate change. Small dietary changes can have a large impact and good food can be a powerful driver of change. 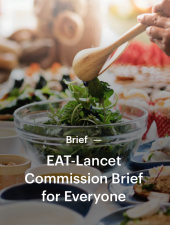 Read about the EAT- Lancet commissions Briefs for Cities; Everyone; Farmers; Food Service Professionals, Healthcare professionals and Policymakers. This report is very comprehensive and challenging so it’s important to find out how it affects us all. If you would like to discuss the changes that you could make to your own diet then do contact us.